sculptural and functional Pottery & Art to appease all. if you can't find what you like tell me and I will do my best and if I can't I may be able to send you to someone who can! Owner-Operator at Kil'n Time Pottery, studied BS MHHS, BA FINE ARTS at UMA Lives in Belgrade, Maine, married to Paul Philbrick. Process and Evolution is about the generations before us that teach us how to be strong, independent individuals. If we put into practice the lessons learned from our forefathers (and mothers) we are (or should be) able to counter any obstacle put forth in our way towards health, wealth, and happiness. By overcoming these obstacles such as in my tree we can grow to become the persons we were meant to be if we make the correct (for us) choices in the obstacle called life, as the roots and branches stretch towards the light from which they receive their nourishment, so too, do we grow towards life fulfillment when we put into practice the lessons from which we were taught. Process and Evolution was created through the uses of a technique involving water balloons and plaster. 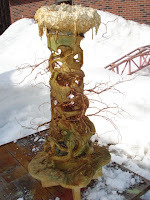 To that I added copper wire and a wire form, as well as other plaster pieces and a wooden base covered in plaster to represent how the lessons taught can help overcome the obstacles put forth from the society in which we grow. The wire (branches) represents our unending ability to wrap our way into and around the processes of life. The copper wheel is the technology that we face on a daily basis and, how we use that technology to enhance our own lifestyles is the key to such health, wealth and happiness. How we grow around such obstacles is the key to success and/or failure. Karen S Kelly-Philbrick im in the studio around 2-5 ish today and tomorrow 10-4 ish....come on down n see it!! Aryeh M. Wismer sure! I could probably drop by tomorrow if you want to take a walk and chill for a bit, maybe around 12, 1? Karen S Kelly-Philbrick sounds good! you can give me feed back too i hope! Carve, carve, scrape, scrape, sand, sand, wrap, wrap, sand, sand, sand, sand... done yet??? Nope! Andrew Karl Siegfried Still hard at work I see, God bless you. Looks good! Karen S Kelly-Philbrick thanx- its fun being back in the swing of things again! Andrea O'Brien Emch, Sarah E. Riddle and 2 others like this. Christine Godfrey Yay! You have studio pictures!!! Paul said you guys wouldn't be in tomorrow...bummer. :( It’s looking good! Karen S Kelly-Philbrick there is a blurb written about this project in my blog: kilntimesblog.blogspot.com I would love some followers! Karen S Kelly-Philbrick ANY THOUGHTS ON THE BASE? Karen S Kelly-Philbrick wait til you see it in person! - When it’s done of course! Karen S Kelly-Philbrick Need feedback. My thought is that it in of itself represents society while the older wiser dead tree continues to nurture new generations of life through its memory and lessons taught...? Did you see the blogs in my blog site? Wish me luck in my submission of this piece to the Harlow Gallery's ART2011!! BIG THAW, Saturday April 16, 2011, Portland, Maine---stay tuned for specifics! CLOSED FOR SEASON-see you next Spring! Belgrade House Artists and Artisans Gallery and Gift Shop-Belgrade Lakes, Maine--NOW OPEN!